The biggest part of the parabronchial wall is taken in by air capillaries and blood capillaries. Both are lined by a squamous epithelium. Air capillaries anastomose strongly with each other forming an extensive network. Numerous air capillaries run into the atria by funnel-shaped openings or infundibula which can hardly be distinguished of the air capillaries. 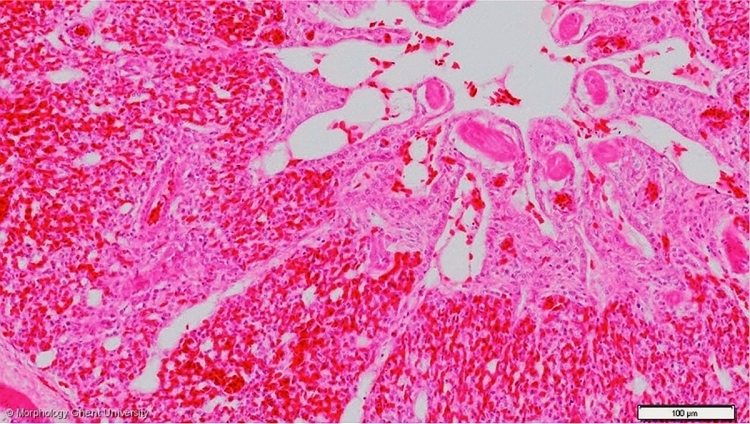 On the micrograph above, a bigger arteriole coming from the a. pumonalis can be seen, supplying the parabronchial wall itself with oxygenated blood, even as a few venules in which the blood capillaries drain.